This travel system package comes complete with Micro Soft Carrycot, a practical and light-weight foldable carrycot with a quick unfolding system, and Koos iSize, the iSize baby carrier with dual installation: isofix or seat belt. The Micro carrycot provides a practical and light option for transporting your baby while he rests. Quick folding and unfolding system. 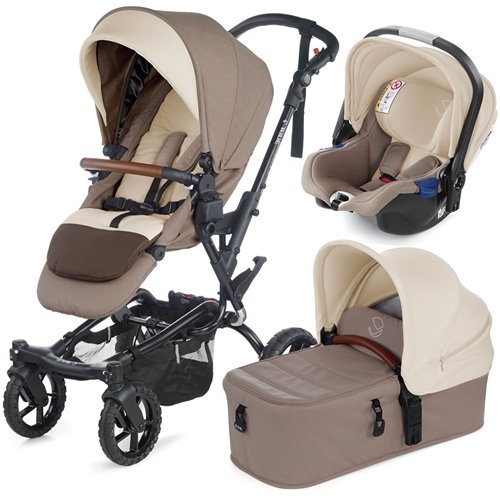 To fold the carrycot you quickly and easily pull the two straps at either end of the carrycot. The stylish modern design is based on an anodised aluminium structure that provides great quality and stability. The Micro Soft carrycot includes an extendable hood and removable apron..
Koos iSize is compatible with the European Regulation R44 and the new R129 (iSize). It can be installed with car seatbelts (ECE R44/04). Suitable for infants from birth to 15 months approx. Group 0+ 0-13kg, or children with a height of between 40-83 cm. Optional isofix base available: iPlatform, this is the quickest and safest installation system, as it prevents any installation errors that could affect safety. Dual installation: isofix or seat belt. The PROFIX connection system makes it compatible with the new iPlatform ISOFIX base and all Jané pushchairs.